Steve Brantley tellin’ it like it is, Tuesday 5pm. Transcript up tomorrow. 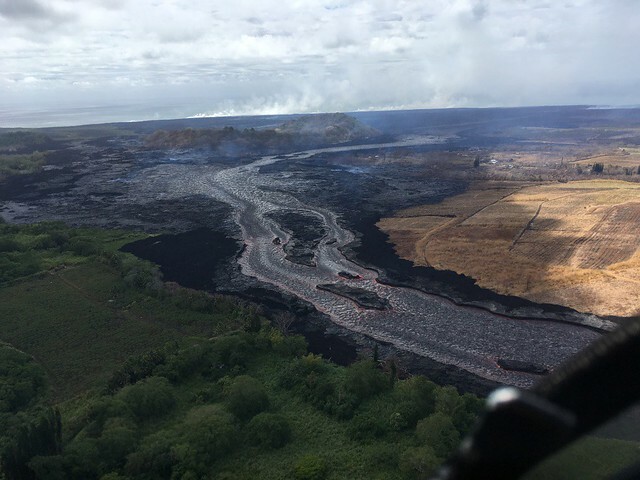 the lava channel rerouting to the west, right, of Kapoho Crater, moving along the southern edge of the main Kapoho lava field & delta towards the ocean. 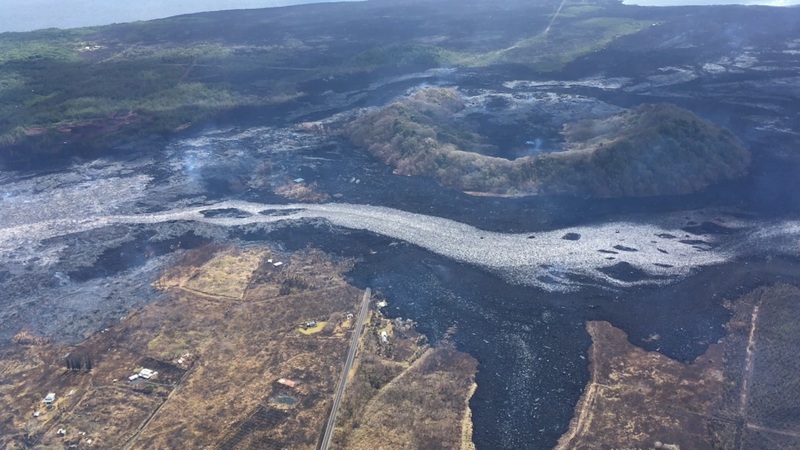 the mess at the junction where it changed directions: there’s cooling lava where it spilled out on both sides of the channel there in the past few days before settling on the west-of-Kapoho-Crater route. Kua O Ka La Charter School with new a’a flow creeping towards it in background. 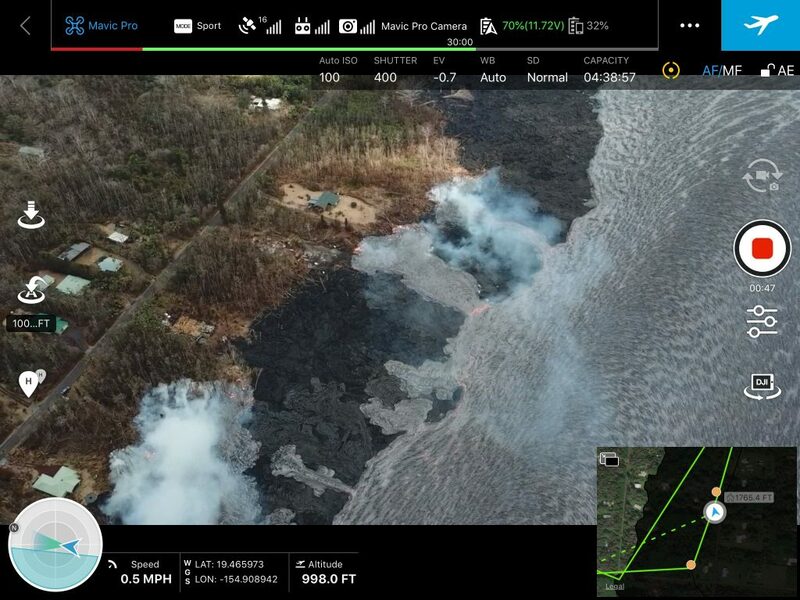 New flow passing east, right of Kapoho crater and traveling along main lava field’s southern edge. This is what Bruce Omori posted some photos from yesterday. At 2:20, they caught a “steamnado” forming from the updrafts. Here’s Mick Kalber’s notes from this overflight (July 10) and Bruce Omori’s blog post for today, July 11, with twelve photos from today (duplicate entry/photos posted on Facebook). Looks like they flew past Fissure 8 before this morning’s spillovers/breakouts. Here’s Bruce Omori’s July 11 blog post again, with the rest of this photo set. USGS: That “surge” in activity was our technicians removing that seismometer. 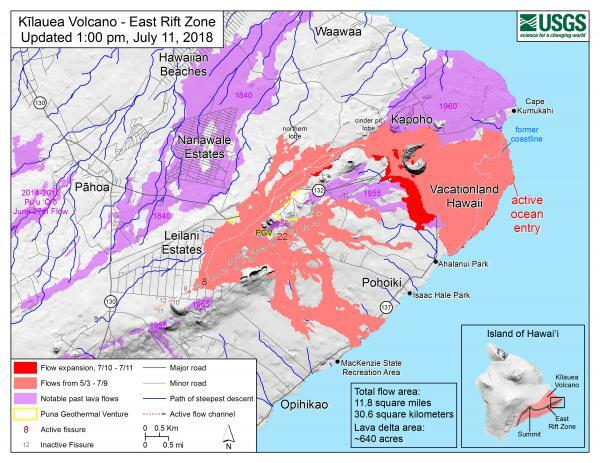 Both ERZ1 and ERZ2 are being taken out of the field today due to the threat of being overrun by the diverted lava channel. Good eye. Q [my question re: Fissure 8 flow affected by summit collapse]: Very interesting, since I think at past community meetings Steve Brantley(?) said USGS hadn’t yet been able to detect a correlation between collapses and effusion rate, perhaps because intervening rock/plumbing blurred the signal. Was it more obvious this time? Is that a change? USGS: It has become more obvious of late. It’s taken some careful observation to make sure it’s actually a correlation, but it does seem that about an hour or two after the explosive events, there is an increase in effusion from fissure 8. Q: Did the summit collapse expand the dike? What’s causing the increase? USGS: Collapse of summit changed pressure regime within the plumbing system. Increasing pressure – pushing more magma out is the likely scenario. Q: Did that cause any more activity at other vents? USGS: Fissure 22 was audible by overnight crews, but no eyeball observations have been made of fissures other than 8. Q: I thought you said yesterday or day before that when the collapse happens a surge occurs in the lava to fissure 8. Did I hear that wrong? Thank you. USGS on FB: We do see a tilt signal out in the middle East Rift Zone after a collapse event, and that implies that there is either a small magma surge or a pressure wave of some kind (we can’t tell which). However, we don’t see evidence for such a surge or pressure pulse at Fissure 8. It may be that it is too smeared out by the distance, so that any surge isn’t detectable at Fissure 8. Comment: I see that rainfall has a big effect, cooling the main channel and causing overflows. USGS: We actually don’t seen any relation to overflows and rain. Overflows occur during pulses of magma supply – this time we saw the pulse at fissure 8 occur approximately 2 hours after the summit collapse event this morning. Q: Looking at the maps on the update, do all of the numerous active areas suggest that the flowing lava is basically spread out under the crust? USGS: Yes, that’s pretty much what’s happening. That makes it harder to track where activity may show up. 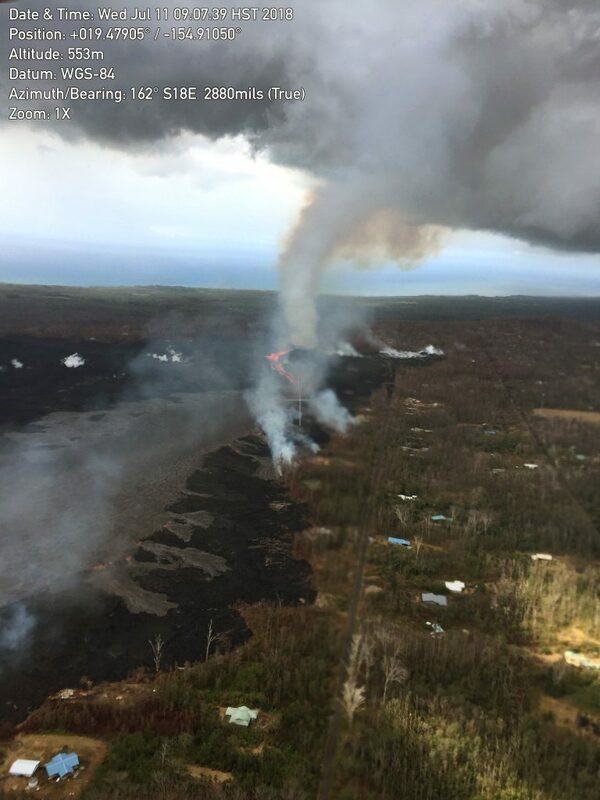 Q: Is it east of Cape Kumukahi now? USGS [July 11, 6:30 HST]: The latest measurement shows that the eastern most point of the ocean entry is still 50 meters shy of Cape Kumukahi. Q: Fissure 22 is still active, but no flow? And does it look like Ahalanui Park will be inundated? 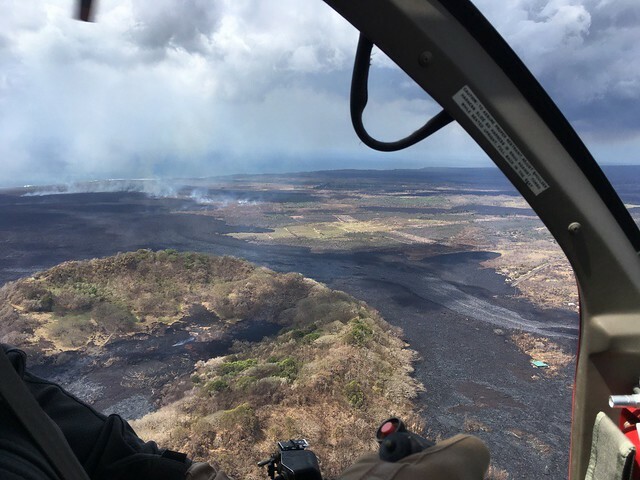 USGS: It’s always hard to say if an area will be inundated, since the flow might slow, or a breakout somewhere else could rob the front of it’s lava supply. But if the present activity continues, it’s not looking great for the park. And yes, Fissure 22 is spattering, with lava activity that isn’t going far at all. USGS: Great catch. There have been many of those whirlwinds today. Heat rises from the lava flows. Due to mass conservation, air goes in to replace it & it will spin as it goes in creating violent vortices like this. They are usually short lived. Q: Will people return to their homes after the eruption? And how high is the black lava wall behind them? Will that be removed? USGS: The height of the wall varies substantially, but 60 feet is accurate in places. [Someone else said 60 feet.] It won’t be removed. That would be rather a lot of work. It might be paved over, or perhaps parts will be removed if there is a desire to reestablish roads in their former locations. The County of Hawaii will decide that. As for returning to their homes, that would be a better question for Hawaii County Civil Defense, but we don’t see why that wouldn’t be the case — people still own their property. Q: What is VEI of current eruption? Effusive eruption is VEI 0, right? But what about explosions at summit? USGS: VEI 0 = effusive eruptions. Field measurements will have to be done after explosive events the summit subside, but those may be barely into the 1 category. Explosive events from rockfall into lava lake prior to summit collapse likely put out more tephra than May 17 explosion. USGS: We agree, and in fact, we use the camera ourselves, since there is no one in the HVO building anymore (it is too unsafe). Hopefully the networking issues can be resolved, but the issue is a lot more complex than just keeping the camera plugged in. We have a lot of data coming through these connections, which are rather unstable right now. Q: What’s going on with the deep quakes south of the summit? USGS: Do you mean the ones near Pahala? Deep earthquakes down there are not uncommon. We think they are related either to Kilauea’s magma plumbing system, or to a mantle fault zone that can be kicked into action by changes in Kilauea’s magmatic feeder system. Q: Why are we calling them explosive events when they are collapse events? USGS: Including the term “explosion” in mention of these events is more for continuity, when they really were associated with explosions (which was over a month ago, now). But they are really just collapse events, and have seismic signatures similar to what is seem in mine collapses. Q: Have you noticed how fast the tilt has progressed from this morning’s 5:46 event? It’s an interesting anomaly. USGS: This doesn’t seem too anomalous at this point. All of the collapse events have been associated with a sudden post-event drop that then becomes more linear. That it looks a bit more extreme today might be due to the fact that the event itself was associated with a larger tilt offset than some past events (maybe due to the longer inter-event time?). Q: Are the boundary faults outside the Kilauea Caldera, and will the explosive events crumble/weaken them too? 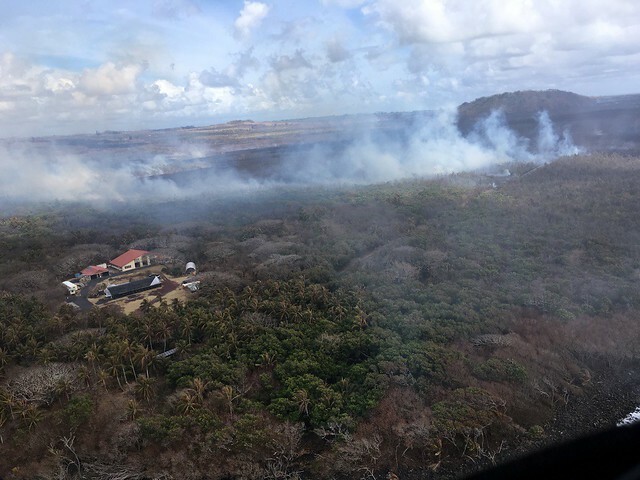 Could the collapse extend into Mauna Loa Subdivision, Volcano Village and down towards Pahala? USGS: The caldera bounding faults are broader than the obvious caldera, but not that broad. In rough terms, the south boundary crosses Chain of Craters Road in the vicinity of Puhimau Crater. 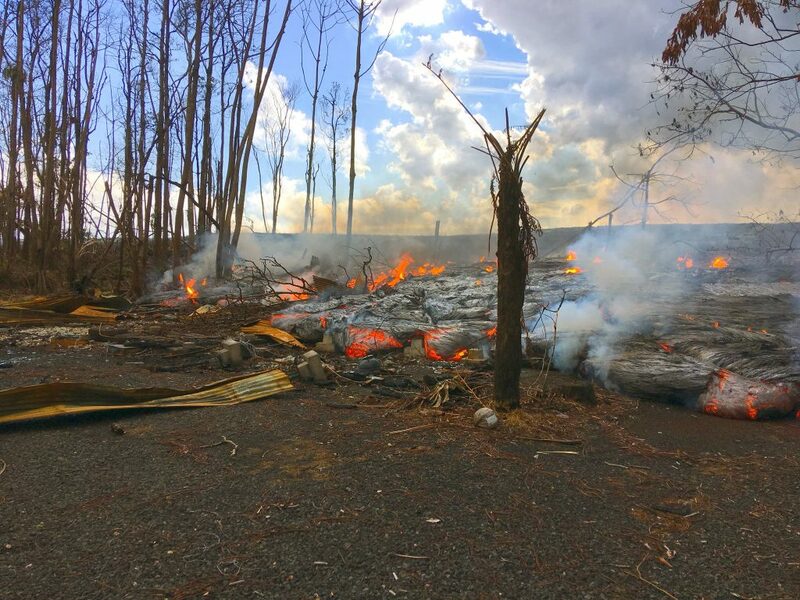 The east boundary is just east of Kilauea Iki. The north boundary is just on the mauka side of Highway 11 (you drive up the outer caldera fault when climbing up form the Hawaii toward the golf course subdivision). And the west side is slightly west of HVO. So, no where near Mauna Loa estates, Pahala, or really even the Village. SO far, we haven’t seen any evidence for major motion along these faults. There are some cracks associated with inward tilting of the entire area due to the subsidence, but the major change is restricted to the inner part of the caldera. but we’re keeping a careful eye on these fault systems to see if the collapse expands beyond its current bounds. 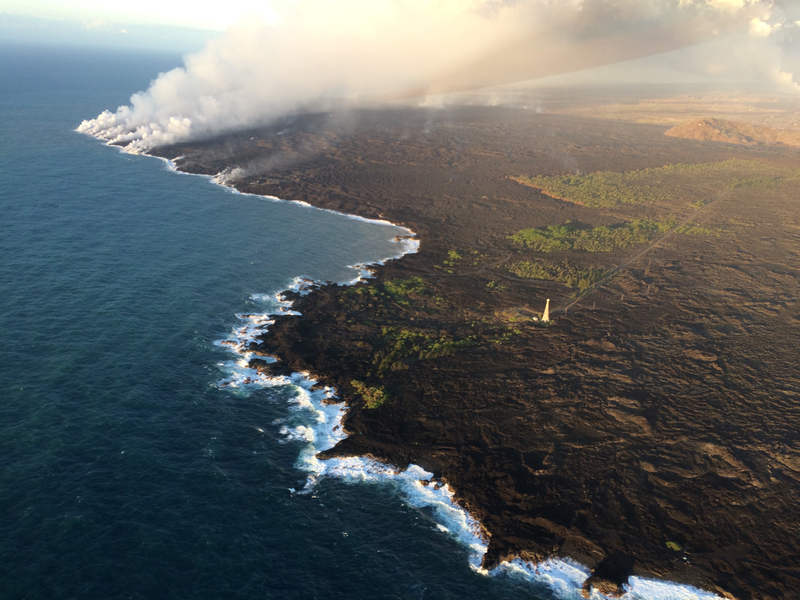 Q: Is magma leaving Mauna Loa and feeding Kilauea? USGS: Mauna Loa and Kilauea have independent magma systems — we can see that they are separate down to 40 or 50 km depth. They also have very different chemical compositions. So we can be confident that Mauna Loa isn’t feeding Kilauea. What we’re seeing is, amazingly, all Kilauea. Comment on summit collapse photo: Don Swanson is my hero. Q: I’m starting to lose hope for this eruption stopping any time soon. Is it still expected to be a months-long event? USGS: That would continue to be our assessment. The summit is depressurizing too fast to keep this up indefinitely. But of course, this eruption is unprecedented in historic times, so we don’t have much to base our assessment on. JosephOfScience: @USGSVolcanoes is it possible for magma withdrawal to continue to the point of the upper storage collapsing? @metrancya: Thanks #USGSvolcanoes for the interesting diagram and the explanation. The elevation difference between the summit and fissure 8 is around 600 meters. Which would mean a tremendously deep hole at the summit. 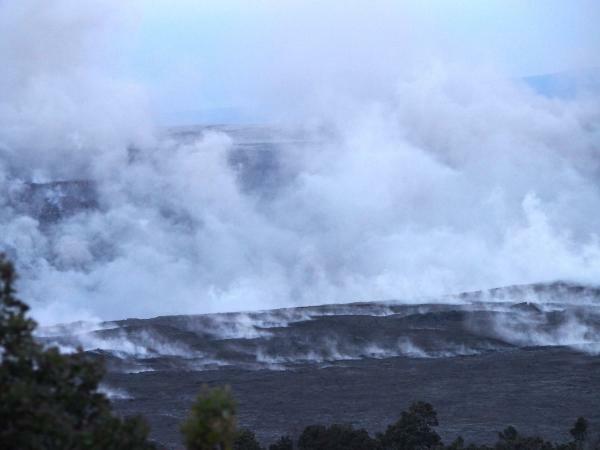 USGS: #Halemaumau floor is over 400 m below the caldera floor – a tremendously deep hole! JosephOfScience‏: So if the upper collapses entirely, that’s when we theoretically might see the possibility of the historic localized pyroclastic flows? More importantly, how difficult is it to deliver a ring of unknown origin to fissure 8 via hobbit? Do they make child sized moon suits? USGS: Additionally, insar data in mid-May did indicate that the deeper magma storage region was involved in summit subsidence. Likely magma draining downward and through that deeper reservoir. PDCs will require a body of water forming in summit – floor dropping below water table.